« Day 61 in Beijing: Jill’s 40th Birthday. Day 62 in Beijing: Fixed Gear Bikes. Juggling. And Bananas. Fixed Gear Bikes, Juggling and a Banana. The connection is so obvious. 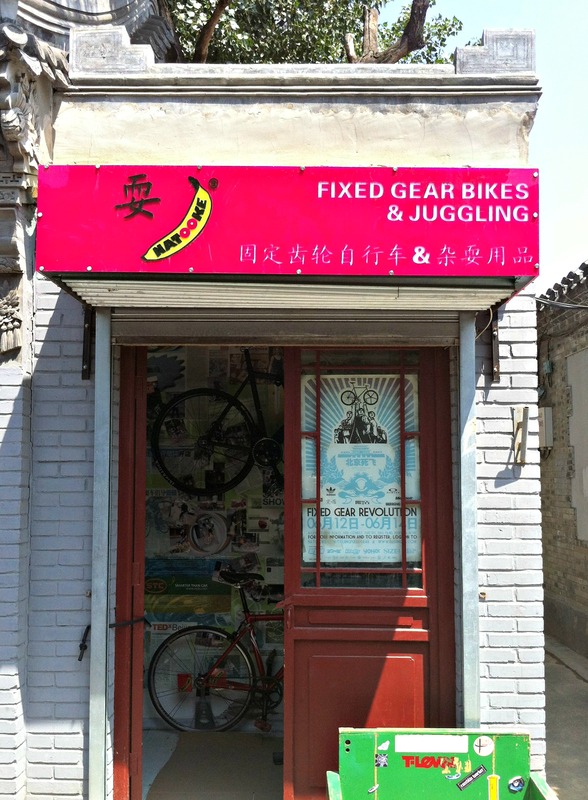 Where fixed gear bikes and juggling go hand in hand like the latest fashion and a Hutong. This store is actually located in a Hutong near the Lama Temple. It is a bit of Beijing, and China, that is sadly disappearing. The Hutongs have been destroyed so that more high rises, office buildings and apartments can be built. Time marches on and it is crushing most of the Hutongs. Luckily, the people of Beijing are starting to realize how precious and culturally significant Hutongs are and are starting to save them. People are moving into them and rent is rising because it is more historic and fashionable to live in one instead of massive high rises with every modern convenience. I love the clay shingle roofs of the Hutongs and the bricks walls. They seem so sturdy and grounded. The Hutongs also have a main plaza where all the living quarters are situated around. This leads to a communal type of living and support system that encourages people to connect and help each other. The garbage cans are in the middle of the plaza so you will see your neighbors going out there daily and can greet them and find out what is happening around the area. Being that I used to juggle and perform with my brother, David Sohigian, I decided to check out this store. There were lots of very stylish fixed gear bikes and a bin with juggling stuff. I still don’t really speak any Mandarin and no one seemed to speak English so Jill and I just walked around, smiled at the absurdity of it all, and left. Next time I stop by, I’ll ask to pick up the juggling pins and see if anyone wants to pass. Just like in the Hutong plaza, community and connection is everything.